The Battle of Gazala (near the modern town of Ayn al Ghazālah عين الغزالة) was fought during the Western Desert Campaign of the Second World War, west of the port of Tobruk in Libya, from 26 May to 21 June 1942. Axis troops of the Panzerarmee Afrika (Generaloberst Erwin Rommel) consisted of German and Italian units. 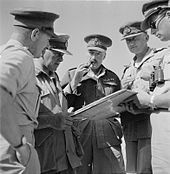 Allied forces (Commander-in-Chief Middle East, General Sir Claude Auchinleck) were mainly British, Indian, South African and Free French. On 11 June, Rommel pushed the 15th Panzer Division and 90th Light Afrika Division toward El Adem and by 12 June had begun forcing the 201st Guards Brigade out of the Knightsbridge Box to Tobruk. The 29th Indian Infantry Brigade repulsed an attack on the El Adem box on 12 June but the 2nd and 4th Armoured Brigades on their left were pushed back 6 km (3.7 mi) by the 15th Panzer Division and had to leave their damaged tanks on the battlefield. On 13 June, the 21st Panzer Division advanced from the west and engaged the 22nd Armoured Brigade. The Afrika Korps demonstrated a superiority in tactics, combining tanks with anti-tank guns in the attack; Rommel acted rapidly on intelligence obtained from Allied radio traffic intercepts. By the end of the day, the British tank strength had been reduced from 300 tanks to about 70 and the Afrika Korps had established armour superiority and a dominating line of positions, making XIII Corps on the Gazala line vulnerable to being cut off. By the end of 13 June, the Knightsbridge box was virtually surrounded and it was abandoned by the Guards Brigade later that night, with their commanding officer Thomas Bevan having been killed the previous day. Due to these defeats, 13 June became known as "Black Saturday" to the Eighth Army. McCrery, Nigel (2011). The Coming Storm: Test and First-Class Cricketers Killed in World War Two. II. Pen and Sword. ISBN 978-1-5267-0698-0. Playfair, Major-General I. S. O.; et al. (2004) [1960 HMSO]. Butler, Sir James (ed.). The Mediterranean and Middle East: British Fortunes reach their Lowest Ebb (September 1941 to September 1942). History of the Second World War, United Kingdom Military Series. III. Uckfield, UK: Naval & Military Press. ISBN 1-845740-67-X. Playfair, Major-General I. S. O.; with Flynn, Captain F. C. RN; Molony, Brigadier C. J. C. & Gleave, Group Captain T. P. (2004) [1966 HMSO]. Butler, Sir James (ed.). The Mediterranean and Middle East: The Destruction of the Axis Forces in Africa. History of the Second World War, United Kingdom Military Series. IV. Uckfield, UK: Naval & Military Press. ISBN 978-184574-068-9. Rommel, Erwin (1953). Liddell Hart, B. H. (ed.). The Rommel Papers (1982 ed.). New York: Da Capo Press. ISBN 978-0-306-80157-0. "The History of the British 7th Armoured Division: The Desert Rats: Engagements 1942". May – June 1942. Retrieved 13 March 2015. This page was last edited on 16 April 2019, at 12:28 (UTC).